The Circle Y Saddlery of Yoakum, Texas, has been in business and producing western horseback riding saddles since the 1960s. The majority of these saddles feature a serial number (actually the model number) on the item. The serial numbers on newer saddles can be decoded to provide information about the saddle. However, even Circle Y is unable to decode the full serial numbers on saddles produced prior to the 1990s due to variations in production and coding. If you are in possession of a Circle Y saddle was manufactured after 1990, you should be able to decode the serial number. Look at the serial number on the Circle Y saddle. It is stamped on a metal plate that is underneath the seat jockey on the left side of the saddle. The seat jockey is the flap that covers the metal bars on the tree between the seat and the skirt. 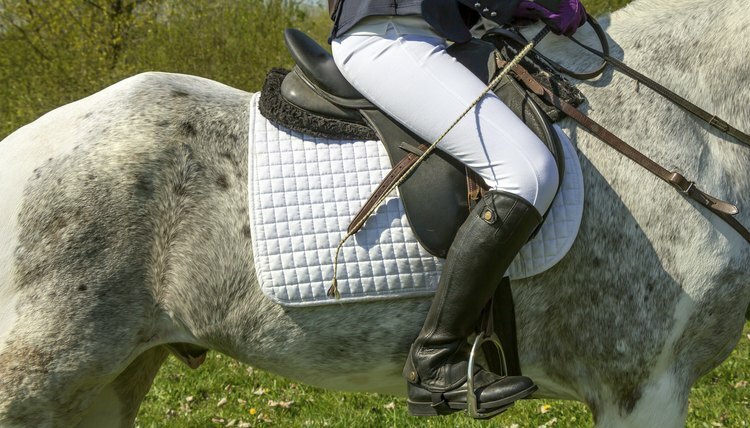 Determine how old your saddle is by the serial number. If it looks like 1234-5678-90, the saddle was manufactured after 2005. It looks like 1234-5678-90AB-CD, the saddle was most likely manufactured sometime between 1990 and 2005. If it does not look like either of these examples, it was manufactured prior to 1990 and the serial number will be very difficult to decode. Decode your 2006 or newer model number as follows: the first four digits are the style number, the fifth digit represents the seat material and color, the sixth and seventh digits represent the size, the eighth digit represents the saddle color and the last two digits determine what size tree the saddle has. Decode your 2005 to 1990 model number as follows: the first four digits are the style number, the fifth digit represents the tree size, the sixth and seventh digits represent the seat size, the eighth digit represents the saddle color, the ninth and tenth digits represent the month the saddle was produced and the eleventh and twelfth digits represent the last two digits of the year the saddle was manufactured. Some saddles may feature a thirteenth and fourteenth digit as well; these digits were added to the serial number of saddles when multiple, identical saddles were manufactured at the same time. Saddles manufactured after 1970 and prior to the 1990s have a three digit style number for the first three digits of the serial number and the fourth digit is possibly the seat size. Saddles manufactured prior to 1970 have a two digit style number as the beginning of the serial number.